Graduate students at the Galveston Campus of Texas A&M University are not just part of the Aggie family, they are our future. Our graduate students are changing the world through their work of discovery, innovation, and entrepreneurship to become successful professionals in knowledge-based institutions, public office or private corporations. Masters of Maritime Administration and Logistics through the Department of Maritime Administration. Students are admitted to these programs through the Admissions Office at Texas A&M University at Galveston. 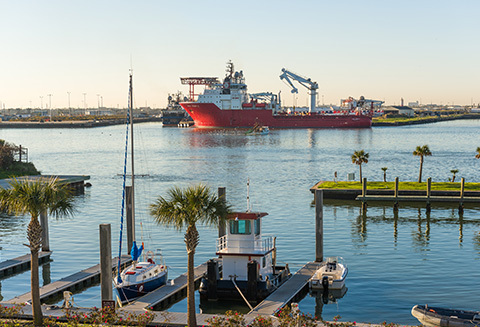 In 2002, the Master of Marine Resources Management (MMRM) degree became the first graduate level degree to be approved by the Texas Higher Education Coordinating Board to be offered at the Texas A&M University at Galveston campus. The Marine Resources Management program provides students with a broad understanding of coastal and ocean policy and management. This degree program views marine natural resources management and policy development from both an ecological and policy perspective. The degree may be viewed as comparable to an MBA as an alternative degree for people working in marine/ocean/coastal organizations. In addition, the degree program may address the needs of some public school science teachers seeking a degree outside the field of education. This program is designed for both continuing students and professionals engaged in management of our ocean and coastal resources. Both thesis and non-thesis options are available in this degree, with courses in economics, policy, law and management well as physical, biological, and information science - all focused on our coasts and oceans. The demand for graduates in industry, government, academia and non-governmental organizations has never been stronger. Federal agencies employing graduates include the U.S. Coast Guard, the U.S. Army Corps of Engineers, and the Environmental Protection Agency. State agencies include the Texas General Land Office and the Texas Commission on Environmental Quality. Industries employing graduates include oil and natural gas, environmental consulting companies, ports, and tourism. These organizations have identified the need for a degree which focuses on national and international ocean resource law and policy; coastal zone management; physical and geochemical marine resources management strategies; and fisheries management. The Marine Resources Management program is a 36 hour degree. Twenty-four hours of required courses constitute the core of the non-thesis program. Twelve additional hours are taken by students as electives according to their particular professional interests. Students who opt to write a thesis will fulfill the requirement by taking twenty-two hours of the core curriculum (MARS 680 is not used) and taking an additional 14 hours of electives of which six credits may be used toward original research for the thesis option degree. For more information, please consult the Texas A&M University at Galveston catalog at http://www.tamug.edu/catalog/. Students applying to the Marine Resources Management program should have a broad base science and economics background with course work in the following areas: biology, chemistry, physics, advanced mathematics, geology, oceanography, and economics. 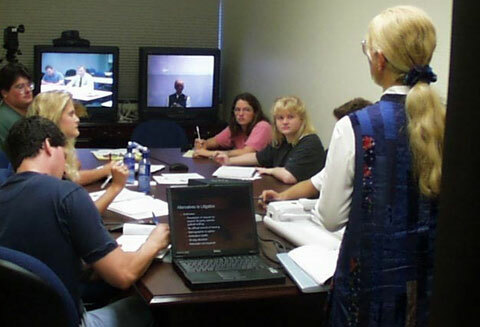 The Interdisciplinary Graduate Program in Marine Biology (MARB IDP) was approved by the Texas Higher Education Coordinating Board in July 2008. The interdisciplinary program spans 3 campuses of the Texas A&M University System and 6 Departments. The host department of the program is the Department of Marine Biology on the Texas A&M University at Galveston (TAMUG) campus. The Department of Marine Sciences also participates on the TAMUG campus. 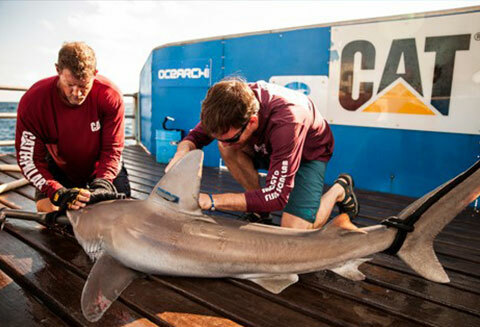 On the Texas A&M University campus (TAMU), the Departments of Oceanography, Wildlife & Fisheries Science, and Biology participate in the program. The Department of Life Sciences is located on the Texas A&M University - Corpus Christi campus (TAMU-CC). MARB IDP is designed for students who wish to pursue careers in education, government, or private industry. The principal strengths of the marine biology program lies in the international recognition, scholarly productivity, and sponsored research funding of its diverse faculty, as well as the strategic location of two of the campuses on the Gulf of Mexico. Typical careers for marine biology graduates include postdoctoral or faculty positions in academia, research and development positions in the private and public sector, government professionals, and industrial professionals. The MARB IDP offers a master’s thesis degree and master’s non-thesis degree and a doctoral degree. The thesis option is intended for students planning to continue with their graduate education at the doctoral level and subsequently enter university-level teaching and research programs, or those seeking governmental service in a resource management capacity. The Ph.D. degree is intended for students who are interested in teaching and conducting independent research in academia, government or industry, or overseeing such research. Students may enter the Ph.D. program directly after the completion of undergraduate B.S. degree if they have sufficient preparation, or may enter with a M.S. degree in biology or a related discipline. For more information, on the Galveston program, please visit the Department of Marine Biology. In addition to a good grade point average and GRE test scores, an applicant for the MARB IDP program should have a solid biology, chemistry and math/statistics course background. This should include courses in general biology, vertebrates, cell biology, invertebrates, genetics, general chemistry, organic chemistry as well as calculus and statistics. For Master's thesis-option and doctoral applicants, applicants must identify a faculty member who has agreed to be a Graduate Advisor/Chair. Applicants who choose a faculty member located at TAMU or TAMU-CC, must apply to those campuses directly and not to TAMUG. The Master's non-thesis track is only available at TAMUG. Three recommendations, either academic or professional, are required. Official GRE scores, less than 5 years old. It is the applicant’s responsibility to make sure that the application is complete by the deadline to assure full consideration. Acceptance into the MARB IDP is competitive and based on consideration of all application materials. Applicants accepted into the program typically demonstrate an ability to succeed in an academically rigorous environment through high GPA and GRE scores. Relevant life experiences may also provide a substantial basis for consideration. A campus visit with personal interviews involving prospective faculty advisors is highly recommended. 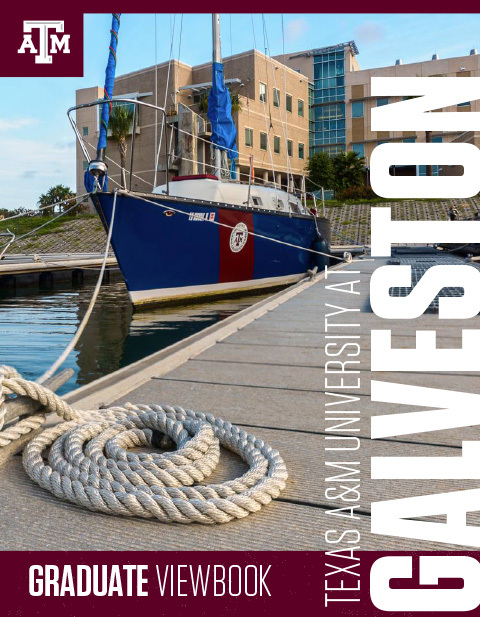 Approved in May of 2011, the Masters in Maritime Administration and Logistics (MMAL) degree is the newest graduate degree to be offered by Texas A&M University at Galveston. The curriculum prepares professionals for leadership positions in maritime transport and logistics in both the public and private sectors. The program builds on the highly successful undergraduate program in Maritime Administration. This Maritime Administration and Logistics program is designed for individual professionals in such fields as port management, supply chain management, public policy as it relates to marine transport and the coastal zone, inland waterways, coastal shipping, and international trade and financial transactions. The curriculum has significant components in economics, finance, business analysis and management. The Maritime Administration and Logistics program is a 36 hour degree. Twenty-one required hours constitute the core of the program. Fifteen additional hours are taken by students as electives according to their particular professional interests, in a thesis or non-thesis format. The Maritime Policy and Law track is designed for those seeking to enter public service and focuses on environmental stewardship in the public and private sectors. The Shipping and Port Management track is intended for those more interested in the commercial side of the maritime industry. Students may also choose five electives that are not structurally part of either two tracks if they prefer. Students who opt to write a thesis will fulfill the requirement by using six of the fifteen elective credits toward original research for the thesis option degree. For more information, please consult the Texas A&M University at Galveston catalog at http://www.tamug.edu/catalog/. Students are assumed to be familiar with the basic accounting, finance, intermediate statistics, microeconomics and the essential elements of the management process. The concepts in these courses are central to the courses that compose the Maritime Administration and Logistics graduate program. These courses are common to many curricula and are found on most 4-year campuses. If students enrolling in the graduate program are not familiar with the contents of these courses, they can consult the undergraduate curricula in Maritime Administration at http://www.tamug.edu/catalog/.